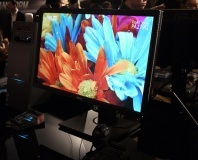 We get eyes on with Asus' new high-end 27in monitor. NVISION 2008: Battlestar Galactica star Tricia Helfer talks about how visual computing affects her role as an actor in a roundabout sort of way. Jordan Mechner, creator of The Prince of Persia, has revealed that a new chapter of the titular Prince's adventures will be released in an upcoming graphic novel.